It's day two of 7 shades of blue and after the light blue creme I thought I'd go for something a bit brighter. 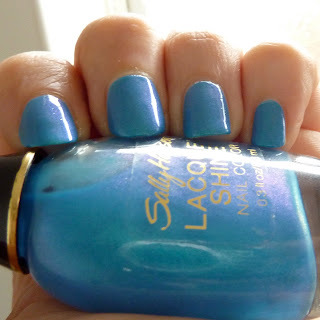 Today's polish star is Flash from the Sally Hansen Lacquer Shine line. I picked up a few Laquer Shine polishes at some poundshops, but they were all red or pink shades, I found this for sale on ebay along with Glow from the same line so picked them up cheap. I don't know how many other colours there are, butI'd like to get them all if they're as nice as Flash. Flash is just beautiful isn't it, it's a lovely bright blue which tons of shimmer, and it really glows. I don't have another blue like it in my stash, and I love that it's so cheap and easy to find. If you didn't like it already, you will when you find out the shimmer has a slight duochrome shift to it, I tried to capture it in this photo, it goes purple which just makes this polish perfect as far as I'm concerned. The application was great, this was two easy coats over a basecoat. What do you think of Flash, and do you own any other colours from the collection?